Located approximately 500 feet to the private beach access! 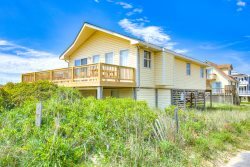 Enjoy ocean views and sea breezes while relaxing on the covered porch at Ten Forward, an oceanside home in Kitty Hawk that has been meticulously well-maintained by its owners. With a public beach access only 500 feet away, you'll have your toes in the sand in no time. Kick back and relax at Ten Forward, and enjoy everything the Outer Banks has to offer at an affordable price. Located at Milepost 4 in Kitty Hawk, Ten Forward is conveniently located close to all of your favorite restaurants, including The Black Pelican, Rundown Cafe, Ocean Boulevard, John's Drive In and Hurricane Mo's. Whether you're a fishing enthusiast or just want a fun and unique sightseeing opportunity, the Kitty Hawk Pier is located right down the road, and the Avalon Pier in Kill Devil Hills is also just a few miles away! Come enjoy all that this home has to offer on your next escape to the Outer Banks, and book your stay at Ten Forward today!